A virtual machine (VM) is an emulation of a computer system. Virtual machines provide the same functionality of a physical computer. We use virtual machines for a range of reasons including to test the bespoke work that we have completed for a customer to make sure that it works well with the system. This ensures that the bespoke work will not negatively affect the live system of the customer. This process also gives the customer a chance to test the bespoke and making sure that it works as per the project requirements established when beginning the project. Once you have established (if there are more than one) which virtual machine is applicable for your testing click on the asterisk *, this will give you your username and password which appear on the right hand side of the screen. To log into the VM, you will need to make a note of these credentials. If the virtual machine is turned off, you will need to start. To do this, make sure "Start" is selecting in the drop down list and click on the > button. 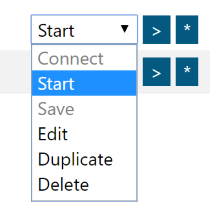 If the Virtual Machine is already running, you can connect to it by selecting "Connect" from the drop down list and click on the > button. This will download the Virtual Machine as a ".rdp" (Remote Desktop Protocol) file. If you get the below error message or 'error 404', while trying to connect to a VM this is because the VM is displaying as running in error. To solve this issue you should navigate back to the list of virtual machines and click on filter, this will refresh the page, this should be repeated until the virtual machine is displaying start rather than connect. At this point you will have to go through the normal stages to start the VM as demonstrated in the ‘how to’ section of the VM help guide. You will need to follow the link highlighted above. Follow the guidance on the Microsoft help page from this point. Please follow this link on the Microsoft help page to download the update. When this update has been installed, you should be able to access the desired virtual machine by following the ‘how to’ section of the VM help guide.